When I came across the admonishment that as a woman I should strive for a gentle and quiet spirit, it was something I immediately wanted, but I wasn't sure if I could attain. By nature I am exuberant, outgoing, and naturally possess a voice that carries - if I am called to speak I don't have a problem projecting and I don't necessarily need a microphone. My vision of what a gentle quiet spirit looked like and my nature were diametrically opposed. Even in this I learned a powerful lesson - God can take anything and change it especially if it's beneficial and we are willing to submit. I didn't know how it would play out. I surely did not have a personality change after requesting this in pray, as a matter of fact it has been a slow process. Anger and resentment are reduced. Attainment of inner beauty is a process - even if you are a gentle soul there are still things in your nature that can be polished. 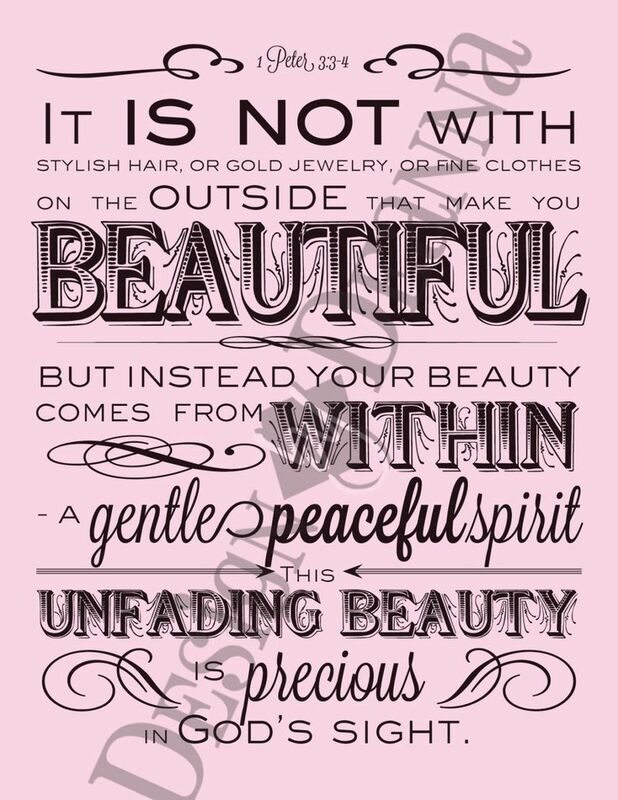 This verse speaks to working on the inside so that we are beautiful on the outside and a blessing to others. Today we are so focused on the outside, that we sometimes neglect the inside. The meek shall inherit the earth, but they will not be trampled over. I'm a work in progress, what about you? Do you have a desire for a gentle and quiet spirit in the context of what God desires for you? This is a great reminder to women who strive to be that Pro 31 woman. Thank you! This is one of my favorite verses because it isn't always my in my nature to be gently or quiet. Like you I sometimes have the need to be heard but as I've written out a list of verses I'd like to conform to I've also noticed a change within. The biggest is learning to live and let live. I can't change anyone and I'm not always right. What may be right for me may not be for another. Thanks for sharing! Why does wanting to be heard and be right so much easier than being a gentle and quiet spirit? I desire it and need lots of help from Him. i so need to work on the sharing my thoughts without raising my voice...oh wow that's a skill i am working on!! sometimes i think the loudness does nothing but to shut people down!! thanks for posting this!